Wang Gungwu (王赓武; 王賡武; Wáng Gēngwǔ; born 9 October 1930), CBE, is an Australian historian of overseas Chinesedescent. 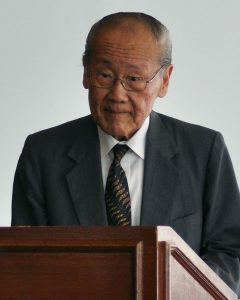 He has studied and written about the Chinese diaspora, but he has objected to the use of the word diaspora to describe the migration of Chinese from China because both it mistakenly implies that all overseas Chinese are the same and has been used to perpetuate fears of a “Chinese threat“, under the control of the Chinese government. An expert on the Chinese tianxia (“all under heaven”) concept, he was the first to suggest its application to the contemporary world as an American Tianxia. Next Next post: P. PINANG SEBENARNYA MILIK KEDAH : KENAPA TIDAK KEMBALI KE PANGKUAN ASALNYA ?